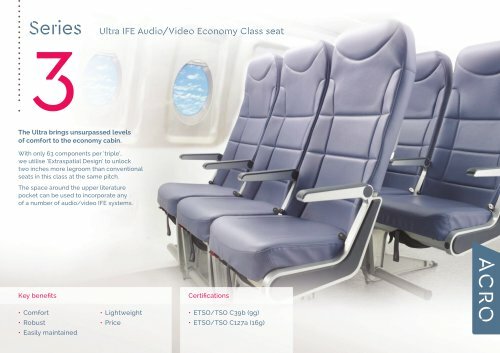 Ultra IFE Audio/Video Economy Class seat The Ultra brings unsurpassed levels of comfort to the economy cabin. With only 63 components per ‘triple’, we utilise ‘Extraspatial Design’ to unlock two inches more legroom than conventional seats in this class at the same pitch. The space around the upper literature pocket can be used to incorporate any of a number of audio/video IFE systems.